Blending traditional beauty with contemporary designs and patterns, the Yu-zen Washi Tea Tin Canister is hand-wrapped in traditional Japanese washi paper. All Yuzen washi paper which we used was performed hand dyeing of in Kyoto, Japan. 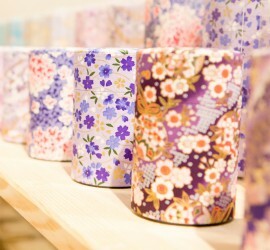 Washi paper is made from the bark of small trees found in Japan and has a soft, comforting texture. Many patterns, colors and sizes can be combined to create a special one and only canister. The Yu-zen Tea Tin Canister is hand wrapped and hand cut piece by piece by skilled craftsmen. The cover snaps into place with an audible "click" to indicate the perfect alignment of the cover and body patterns. Each and every Yu-zen Tea Canister is hand-finished for perfect precision and quality.